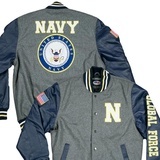 Enjoy this classic US NAVY Varsity Jacket from our Sports Patriotic Collection. The varsity jacket features an athletic cut body in non-pile wool with navy leather sleeves, two double welt slash pockets with navy leather trim, banded knit waist, cuffs, and collar in navy, gold and white. In addition, the jacket has a snap front closure, inside breast pocket, one inch diamond quilt lining with polyester fiberfill. It is decorated with a 4.5" "N" on left chest, and "GLOBAL FORCE" written in white tackle twill down the left sleeve. Embroidered appliques decorate the back with "NAVY" and the Official Emblem of the United States NAVY. The Right sleeve has the United States Flag waving as you enter into battle. Fully licensed product of the U.S. Navy.